Bangladesh opposition leader Khaleda Zia has been granted bail by an anti-corruption court after leaving her office compound for the first time in three months. 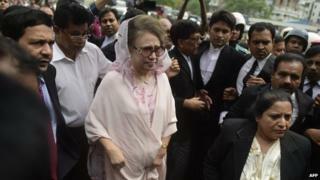 Ms Zia, who is the leader of the Bangladesh National Party (BNP), is accused of embezzling charitable funds. Her supporters say the charges are politically motivated. The move is seen as a potential easing of tension between Ms Zia and the Prime Minister, Sheikh Hasina. She waved to dozens of chanting supporters as she left the court after the hearing to return to her home. She is accused of embezzling $650,000 (£435,000) in two corruption cases involving charitable funds during her last term as prime minister from 2001 to 2006. She is also facing charges of instigating violence. Her supporters say the charges are political and that Ms Zia has been forcibly confined to her office since early January, when she had threatened to lead a mass anti-government rally to protest against last year's national election. The BNP refused to take part in the poll, saying it was rigged. But Ms Zia's opponents say her decision to remain in her office was voluntary. More than 120 people have been killed and hundreds injured in recent political violence as the opposition mount strikes and transport blockades aimed at toppling the government. The United Nations and the European Union, Bangladesh's biggest trade partner, have urged the government and the opposition to hold talks to end the crisis.